The midday sun beats down mercilessly on a road construction crew in the height of summer. Sweating, scowling workers take frequent water breaks but fail to get relief. Suddenly, one of the bulldozers veers away from the road as the operator faints from the heat. The rest of the crew scrambles out-of-the way. Fortunately, one of them climbs up and shuts off the machine. However, the bulldozer operator has suffered heat stroke. If the crew doesn’t find a way to quickly reduce his core temperature, he might suffer long-term effects or even die. Working in excessive heat can quickly raise a worker’s core body temperature to a dangerous level. The worker or his managers may not even be aware that he is at risk for a serious, or even fatal, heat-related illness. Protocols for preventing heat stress in the workplace stress having plenty of cold water available on the site. However, drinking cold water has very little effect on core body temperature. While it provides a temporary feeling of relief, within moments, his core temperature returns to its previous level. An option for workers inside a facility may include having an air-conditioned break room where they can temporarily escape the heat, but it may not be practical in many facilities and often results in lost productivity. An air-conditioned break room is not an option for construction workers, agricultural workers and others who work on remote job sites. What options do managers have for protecting their workers from heat-related illnesses? They can either cool the individual worker or provide cooling equipment for the entire crew. Up to now, consumer-grade ice or gel vests were the only practical option for most workers. But these vests require the cooling packs to be frozen or refrigerated prior to use. Ice and gel vests can restrict a worker’s range of motion and even overchill the body. Their cooling effect only lasts about two hours. Then the elements must be recharged in a freezer or refrigerator. However, new advances in personal cooling technology overcome these limitations. Salt-based phase change packs used in advanced cooling vests such as the PhaseCore cooling vests manufactured by First Line Technology are a significant improvement over ice vests and gel packs. Instead of chilling the wearer, the salt-based phase change packs absorb excess body heat, reducing the level of heat stress the wearer experiences. The PhaseCore cooling elements have an activation point of 28°C. When the ambient temperature rises above this point, the elements begin to absorb heat energy and transform from a solid to a liquid. PhaseCore Cooling Elements will remain at their activation point as the heat energy is absorbed and stored. When heat is absorbed, the PhaseCore elements provide a comfortable and soothing cooling effect. PhaseCore elements recharge and return to their solid state when the ambient temperature drops below the activation point. PhaseCore Cooling Elements have a 10-year or 6000-use life cycle. First Line Technology sells a convenient PhaseCore Go-Pack that combines an insulated Transport Bag with ice packs and four personal cooling vests. Go-Packs can keep four vests fully charged for a complete eight-hour work shift in 35°C heat. The packs also include vest extenders to allow the wearer to adjust the fit of the vest. 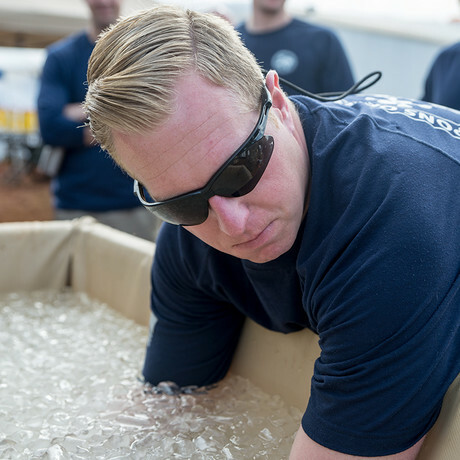 Another option for preventing on-the-job heat stress is to deploy a cooling device that can be used by an entire crew to rehab and quickly reduce their core temperatures. Research has proven that by immersing the forearms and hands in cold water, an individual’s core body temperature can be reduced by 1°C every three to 10 minutes depending on the temperature of the water. The Immersion Cooling Equipment (ICE) System manufactured by First Line Technology is a lightweight and portable heat stress prevention unit. The ICE system is designed to stand at a convenient height for users to immerse their hands and forearms to reduce body heat and easily allows up to six individuals to safely cool their core during rest cycles. The rugged powder-coated aluminum frame holds up to 48 gallons of water and ice and up to 270 kg of total weight. In emergency situations where full immersion is necessary, the ICE system can hold the full body weight of one adult. ICE System folds flat and is easily portable. One person can set the unit up in under two minutes. You simply fill the waterproof and mildew-resistant vinyl basin with water and add several bags of ice. On remote sites, commercially available ice chests can keep ice frozen for up to five days. The users simply immerse their forearms up to the elbows and walk in place to circulate the cooler blood throughout their bodies. The workers not only feel temporary relief from the heat but are also less likely to suffer a heat stress-related illness or accident. While both the PhaseCore professional grade cooling vests and the Immersion Cooling Equipment System work well on their own, deploying both devices in the workplace provide a fully integrated approach to heat stress management. Workers can wear the PhaseCore cooling vests while performing physical activities and then remove the PhaseCore phase change elements and insert them into the Immersion Cooling System while taking a break. By immersing their forearms while the elements recharge, workers can keep their core body temperatures in a safe range throughout the workday. For more information on PhaseCore professional-grade cooling vests and the Immersion Cooling Equipment (ICE) System, visit https://www.firstlinetech.com/phasecore/australia/. Around the globe, and from factory floors to construction sites, noise hazards are a real challenge. Protecting workers from hazardous noise levels is an ongoing challenge for many organisations.